Just confirmed on the Sonic City Blognik, get ready to break out your Extreme Gear one more time for the third installment of the Sonic Riders series, a special varient for Microsoft’s new Kinect system for the 360 that was previously known in development as Project Natal. Details are sketchy at present but it does appear you’ll again be playing as Sonic and co. and as with the rest of the series you will be doing battle with the Babylon Rogues and their leader Jet The Hawk who rather handily is in the keyart SEGA have given out. And hey, we’re that on the ball I’ve already swung into action and crafted a background for the site for Free Riders! Neato. 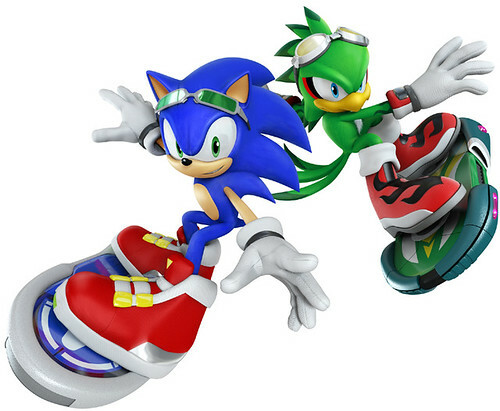 Sonic Free Riders™ brings full body motion controlled fast-paced boarding action into people’s homes! LOS ANGELES (June 14th, 2010) – SEGA Europe Ltd. & SEGA America Inc., today announced Sonic Free Riders™. Set for release Holiday 2010, Sonic Free Riders™ offers an extreme fast-paced boarding game and is developed to take full advantage of “Kinect” for the Xbox 360® video game and entertainment system from Microsoft. For the first time ever in a SEGA game, full-motion body control will allow you to twist and turn your way through a range of visually stunning courses in an action-packed Sonic experience unlike any other! “Kinect’s” unique motion sensor means Sonic Free Riders™ will see family and friends controlling their fully customisable hover board or bike by twisting, turning and jumping in an exhilarating race to be the first to cross the finish line! Choosing from one of your favourite Sonic characters, or your own Avatar, you can reach out and grab a variety of pickups along the course. By throwing, shaking, or swinging your arms to launch your weapon, you can gain the competitive edge over your rivals in high octane single or multiplayer races. Sonic Free Riders™ will be available to play with “Kinect” for Xbox 360 for Holiday 2010. I see “Sonic Riders” and I just think “Meh”.